"I'm shocked that Nintendo of America didn't release it, instead going for the more RPGish sequel. Why couldn't they have released both?" The Goonies is not only a fantastic movie, with the ugly Sloth and the evil Fratellis, but was a fantastic video game series for the Famicom. I know what you're thinking, "A series? I thought there was only Goonies II? Why was it 'II', anyway?" Well, it was "II" because there was a first, and NES gamers just didn't get the first, for whatever reason -- maybe because it was amazingly short, a little bit confusing (though Goonies II gets me lost at parts), and sometimes you could get stuck, not knowing what to do next. Plus, it played more like an arcade game, and Nintendo tried to release few arcade games for the NES in America, to move away from Atari's mistakes. So, oh well, our loss...kind of. The Goonies is a fantastic game and available for you as a cart or disk for the Famicom. Uh oh...The Goonies are all missing, and so is your girlfriend! You, as Mikey, I guess, have to find them all, and find three keys in each level that unlock a giant gate that leads you to the next level. For one thing, you have to be careful, as enemies abound. It's a thoughtful and original storyline, which is strange for early Famicom games, but not altogether strange for Konami. The game is very simple looking for its time. Goonies II is only a bit better. The characters are small on the screen, and the Fratellis look goofy when they run up to you, almost like midgets. The backgrounds are unique for each level, like a cave, ice, and attic. Other than that, there's nothing out of the ordinary for 1986. Nice work by Konami on the music! "Goonies R Good Enough For Me" was nicely 8-bitted. 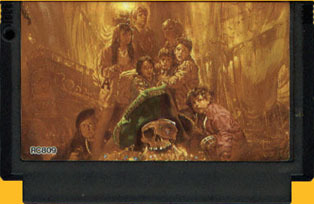 Of course, not as nice as in Goonies II, but it's still a nice song to listen to. In later levels, the theme changes to some captivating evil tunes. The sound effects are kind of cheap, but the fact that it came out early in the Famicom's lifespan, before sound effects were a priority, gives it a pass here. You get to hear things like your kick and bombs exploding. There are five levels, with the last level being really long. You have a set amount of time to find keys and the Goony in each level. You have to kick enemies, who drop bombs. Sometimes if you kick a certain rat, it'll drop invisibility. You have to use the bombs to blow open doors. Sometimes, if you get too close to the bombs during the explosions, you get hit and lose health. Also, hidden in certain areas of levels are gems that give you points, and also hidden are important items you'll need to get to certain areas of the game. This makes it a bit of a pain, and that's the reason The Goonies doesn't get a "5". The controls are smooth. My only problem with it is that sometimes the kick is badly flawed, causing you problems. Other than that, nothing else is too bad. You can jump and kick, and use the D-pad to move around each stage. You get to climb ladders to avoid enemies, like rats, skeletons and the Fratellis. The game is pretty frustrating. Sometimes you'll get close to finishing, and the time runs out, or you'll lose all of your health, but that's what adds to the fun factor, making you want to play until you fully finish the game, overcoming those challenges. Konami certainly didn't make this one easy. The Goonies is pretty fun. I like to see how far I can get, and even try to do speed runs. It's a game that you'll want to play often, especially to try getting every item in the game. This is an amazingly good game. I'm shocked that Nintendo of America didn't release it, instead going for the more RPGish sequel. Why couldn't they have released both? As for which I like more, the first or second game, that's a tough call. I like both equally, I'd have to say. The Goonies is hard to find nowadays, and can cost more than the common games, but keep your eye out and pick up a copy, it's definitely worth it.